We are only ten days into 2019, and it’s already looking great on the representation front. We can add one more amazing Muslim woman to the list of those who have recently broken a glass ceiling in politics. 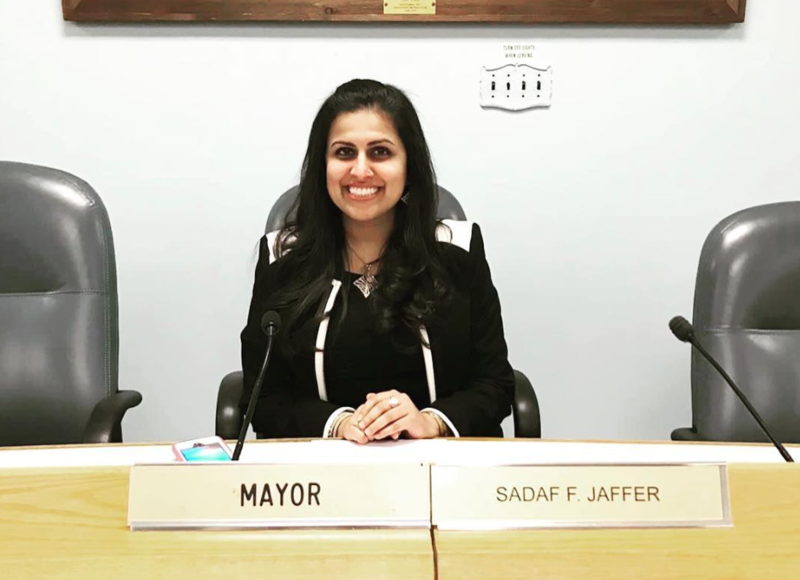 Sadaf Jaffer, a postdoctoral research associate at the Princeton Institute for International and Regional Studies recently added the title of mayor to her already impressive resume. On the 3rd day of January, Jaffer was sworn in as mayor of the Montgomery Township, becoming the first female, South Asian American mayor in New Jersey’s history. Prior to this monumental career-shift, Jaffer served as a Montgomery committee member after being a resident of the area for five years. Catherine Gural, who was sworn in as deputy mayor along with Jaffer, believes Jaffer will be a great addition to the mayoral office. “There is an opportunity to bring her experience as an educator and academic to what has been a traditionally ‘managerial role’.” Gural spoke about how the role in the past was mainly occupied by attorneys, or executives in other industries, such as pharmaceuticals and finance. Jaffer has worked for the United States Marine Corps Centre for Advanced Operational Culture Learning, and the U.S. Department of State’s Bureau of South Asian Affairs. She also has a doctorate from Harvard University in Near Eastern Languages and Civilizations. This wonder woman is still not done, despite her already admirable strides. Jaffer, being a proud Muslim and scholar of South Asian Islamic and Gender Studies, is also working on a book entitled ‘Lady Genghis Khan: Ismat Chughtai, Progressive Literature and Secularism in Modern India’, which aims to offer a new lens on Islam in India. Jaffer is also conducting research for a second book project on South Asia and their relationship with, and use of social media. One thing is for certain, Sadaf Jaffer represents the 21st Century Muslim American woman, and there are no plans of her slowing down. So here’s to more Sadaf Jaffers in our communities, who are now inspired to break more glass ceilings this year, and in the many years to come. #MGAnon: Why Is My Faith Slipping Away?